For the past 50 plus months – sometimes several days a week – Ronny Drayton has made the journey to Rikers Island. It can be a dehumanizing experience. Just getting into this place can break you: intense and intrusive searches by authorities met you as you enter this cold, unforgiving facility. Yet he goes. Faithfully and diligently. Ronny Drayton goes there to see his son Donovan, who has been held there for the past 50 months without bail. This despite the fact he has no previous record and no prior convictions. Ronny makes that weekly journey into a pit of hell because he knows his son was innocent. Donovan never copped a plea. He never dimed anyone out. Donovan Drayton had one demand and never wavered from it: He wanted his day in court. The path to that day in court usually grinds the defendant into a plea deal. But it make Donovan and Ronny’s resolve even stronger. The outpouring of support from family, friends and associates – all of different ethnic backgrounds and faiths – was tremendous. Here’s this young Black man, one of far too many ensnared in the criminal justice system, having this much support with each court appearance and being lead by his father – an active father – confounded even the most cynical of court observers. Yet, despite facing the prospect of life in prison, despite the fact the back-breaking reality that going to trial would put them in financial straits – perhaps for good, despite all of the pre-trial stall tactics, Donovan and Ronny didn’t waver. Donovan wanted – and finally got – his day in court. As the trial unfolded, it became crystal clear that Donovan Drayton was not at the crime scene much less the trigger man. No forensic evidence – which is pretty much the standard in any murder case – was presented. No gun was produced and the two major witnesses for the prosecution – both armed with sweetheart immunity deals – contradicted and perjured themselves on the stand. The outcome was inevitable. Not guilty on all major charges. For the minor charges, the jury was hung: 10-2 in favor of acquittal. The only reason Donovan didn’t come home was because of the lack of alternate jurors. In a court of law, Donovan Drayton was able to clear his name. Yet he remains in jail. Despite overwhelming evidence that says the contrary, Queens District Attorney Sean Clark – facing a spot on an otherwise spotless conviction rate – decides to re-try Donovan. Still no bail, even though Donovan has no prior criminal record and insisting on a trial. Still in Rikers Island, trying to keep his nose clean and his dignity intact. And Ronny still makes the deep, dark journey to the cold Island in Queens. But Ronny – like his son – is a fighter. A good fighter has strong weapons. Ronny decided to use his best weapon to take a stab at a system that has been attempting to drain the heart and soul of everything he holds dear. Ronny called a couple of his long time friends. Jimi Hazel of the genre-bending 24-7 Spyz. Vernon Reid, Will Calhoun, Corey Glover, Doug Wimbish of the Grammy-award winning band Living Colour. Hip hop pioneer Afrika Bambaataa. LaRonda Davis, Darrell McNeill, Greg Tate and yours truly of the Black Rock Coalition. He wanted to make a beautiful noise for his son and for all of those who are getting crushed – emotionally and financially – by the criminal justice system. We all had the same answer: Yes, we’re down. We will stand with you the way you have stood with your son. 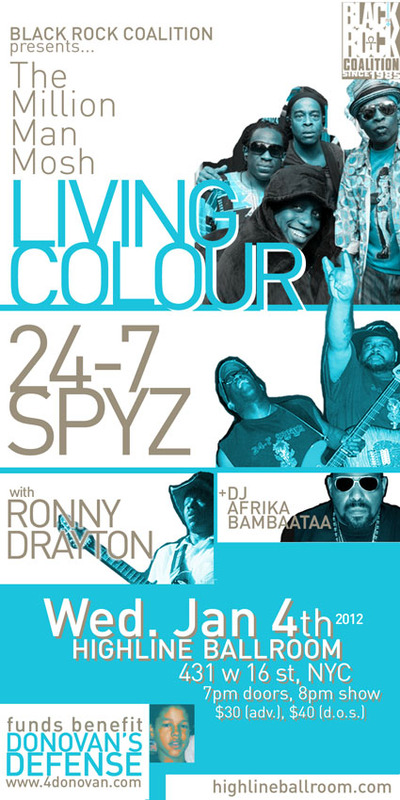 On January 4th, The Black Rock Coalition will present ‘The Million Man Mosh: A Benefit For Donovan Drayton’ featuring Living Colour, 24-7 Spyz, Ronny Drayton, and on the decks, Afrika Bambaataa at The Highline Ballroom in New York City. Tickets are on sale now online and through at The Highline Ballroom box office. You can also go to http://www.4donovan.com to make a donation or to find out more information. All proceeds will go to cover Donovan Drayton’s legal expenses. Ronny Drayton has been for his son, his family and for all of those who love Black Rock. Let’s be there for him. Author of the book, 'Black Rock Volume 1', which is available now at Blurb.com and as an e-book on Barnes & Noble.com and Amazon.com. Executive Director of the Black Rock Coalition New York Chapter. Photographer, music fan, Yankee fan, supporter of the arts! People can and do change grow love hear with a open heart . Every one needs some 1!